Apple CEO Tim Cook enjoys touting the high ratings of his company’s products in areas like usage, customer loyalty, and customer satisfaction, but he may not be so thrilled about the latest rankings from J.D. Power. 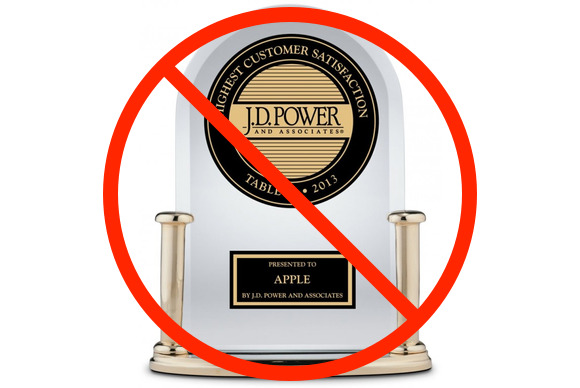 For the first time since the firm started measuring customer satisfaction for tablets, Apple has dropped out of the top spot. In volume two of the 2013 U.S. Tablet Satisfaction Study, it was Samsung who took the crown with a score of 835, just edging out Apple’s score of 833. Apple can console itself with the knowledge that it still handily beat the average satisfaction rating of 821. The iPad also topped Amazon’s Kindle, which scored 826; Asus, which came in at the average of 821; and Acer, who was also in the study. But why the shake up at the top? The answers come in the more detailed breakdown of the study: Apple scored top marks in overall satisfaction, performance, ease of use, physical design, and tablet features; Samsung, on the other hand, scored similarly high in overall satisfaction, but ranked no more than “better than most” in physical design and tablet features, and brought in “about average” ratings in both ease of use and performance. So how did the Korea-based firm squeak into the top spot? Price, my friends—price. Samsung nailed a “better than most” rating in the cost category, whereas Apple was relegated to “the rest.” That single ding alone was apparently enough to drop Apple to second place. I can’t imagine Cook or the rest of Apple will be crying into their $100 bills about this—Apple’s products have always been about quality at a price, and the company knows that’s not going to appeal to everybody. But it will be interesting to revisit the ratings next year and see how the expansion of the iPad line—which now has two iPad minis, the iPad 2, and the new iPad Air—affects Apple’s rating. Either way, Apple’s chief executive is going to have to come up with a new favorite statistic for next quarter’s financial results conference call.